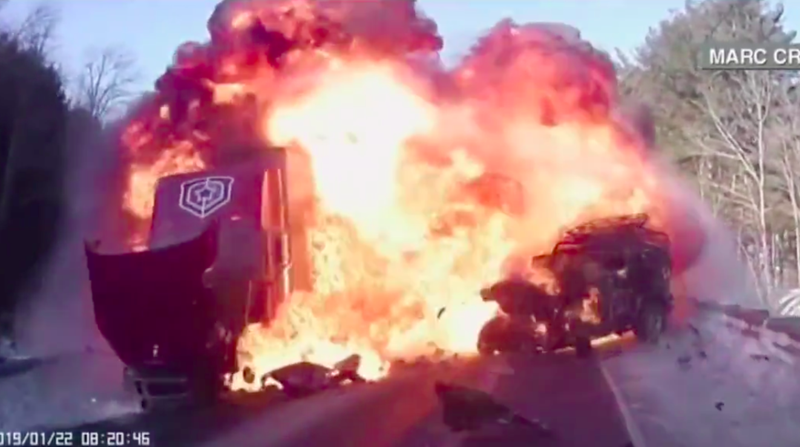 An 18-year-old college student driving a Jeep Wrangler TJ miraculously survived a crash with a semi truck—a collision that burst the latter’s fuel tank, creating a massive fireball that looks like something out of a Hollywood movie, Boston 25 News reports. After being pulled from his Jeep by occupants of a third vehicle, the student was reportedly taken to a hospital, where he’s now being treated for serious injuries. That footage came out of a vehicle occupied by a father and son, who both helped remove the student, named Samuel Lachance, from the burning Jeep, Boston 25 News writes. “He is somewhat alert. He is able to recognize people. His burns are healing unbelievably well. So he’s coming along, but he does have a pretty traumatic brain injury. Someone in Jeep community has set up a Gofundme account calling for Jeep enthusiasts to support the family as Samuel recovers. That page includes a post-crash picture of the Jeep; unsurprisingly, it’s mangled.